A Mount Vernon Washington resident needed a two car garage that was functional and durable, yet something that didn’t look like your typical garage. With so many different options to choose from, he finally decided upon a red Dutch Gambrel two car garage. 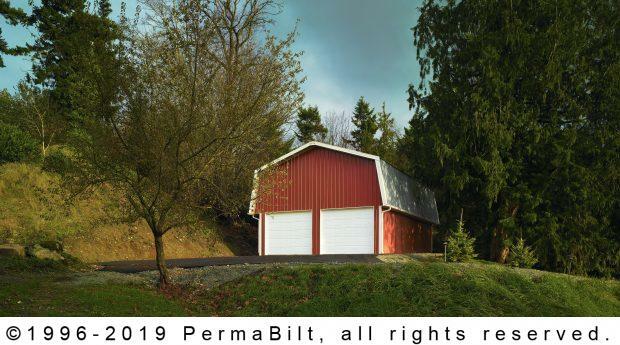 From there, PermaBilt® continued the process, helping our customer with design, financing, permits, construction and all his questions in between. For reliable access to his cars, our customer wanted sturdy garage doors so he picked two raised panel steel overhead doors. These 2” thick doors included toggle locks, bottom weather seal, vinyl stops along sides and top, and a 15 year limited warranty. Additionally, he chose our 3’ x 6’8” PermaBilt® doors which included a polyurethane foam core, reducing sound and possessing superior insulation. Each door included three hinges, full perimeter weather stripping, a rolled edge and a stainless steel lock set. 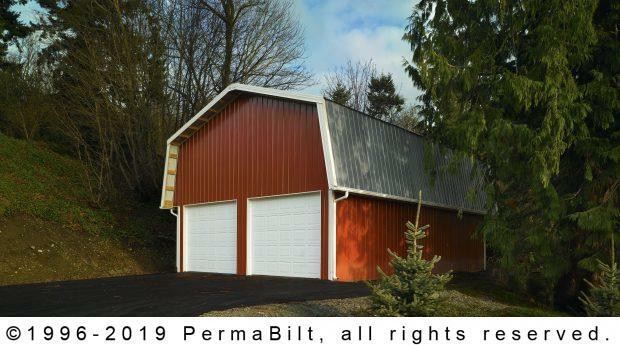 Once the building was erected and the doors were placed, the customer was extremely satisfied not only with the craftsmanship of his new Dutch Gambrel garage, but also with the quality of service that was provided. "Great looking building. Crew leadership were outstanding."